The folks over at WhoopTee threw together this fantastic custom shirt, so I can be a walking billboard. And because I know you all want to be walking billboards as well, I get to give three of you lucky ducks a tee of your very own! TO ENTER: All you have to do is hop on over to the WhoopTee site, then come back and tell me in the comments (before Tuesday, August 28th at Midnight) what style & color tee you’d be putting the City in a Jar logo on! (I’ll need an email address, so I can get a hold of you.) Good luck! For extra entries, tweet “i want to win this @cityjars giveaway! my fave is the (insert color) tee from @WhoopTee! http://bit.ly/TXsXbM” or you can like both City in a Jar & WhoopTee on Facebook! Don’t forget to come back & comment letting me know you’ve done it! Nitty gritty: Giveaway ends Tuesday, August 28th at Midnight. Three winners will be chosen using random.org & will be announced on Wednesday, August 29th. You must be over 18 and reside in the United States to win this giveaway. Thanks to those who entered. Congrats to the winners! Gildan DryBlend Jersey Sport Shirt with a Pocket (Royal) would be the best. Business classy with a pocket to put your iPhone or smartphone in. Stay Classy St. Louis. Oh. I totally love City in a Jar. I’m so proud of you Jessica! You are a rockstar in my book! I would be the best walking billboard! All I need is an American Apparel Fine Jersey in the color of Cranberry because the world needs more cranberry colored t-shirts. Then put me on street corner with a boombox blasting Michael Jackson and see people line up to watch the City in a Jar billboard man and his sweet dance moves. I’m loving the American Apparel Fine Jersey style and I would get the color coral. I’d love to be a billboard for your brand my dear. I love you and your site so much, I stopped you on the street to say hello! I would proudly wear a Gildan Ultra Cotton T-Shirt in Charcoal to represent the Arch of this fabulous city! Really though, any of the colors would be awesome! I’ve already told so many people about your site! You know I would love a shirt! American Apparel Fine Jersey, Size M, Color: Sunshine. 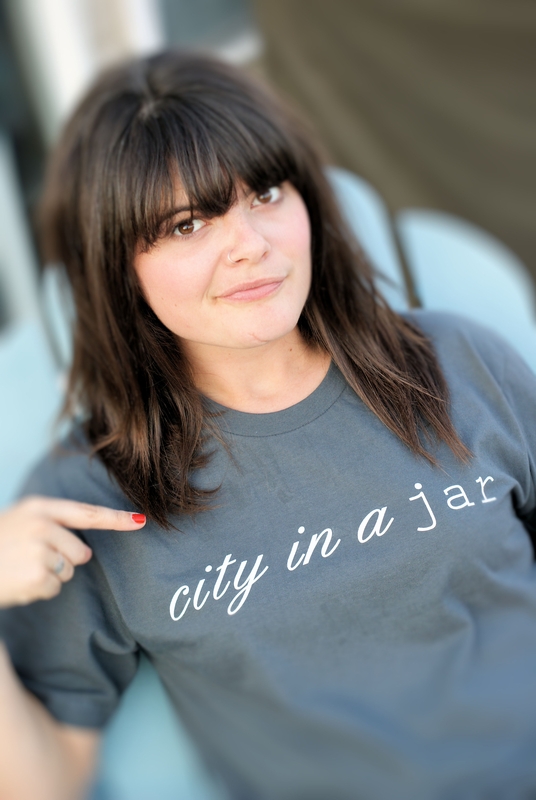 I would luuurrrvvvee a City in a Jar Tee!! Bella ladies scoop neck, black would be lovely ma’am. P.s. I’ll buy one if I don’t win one.